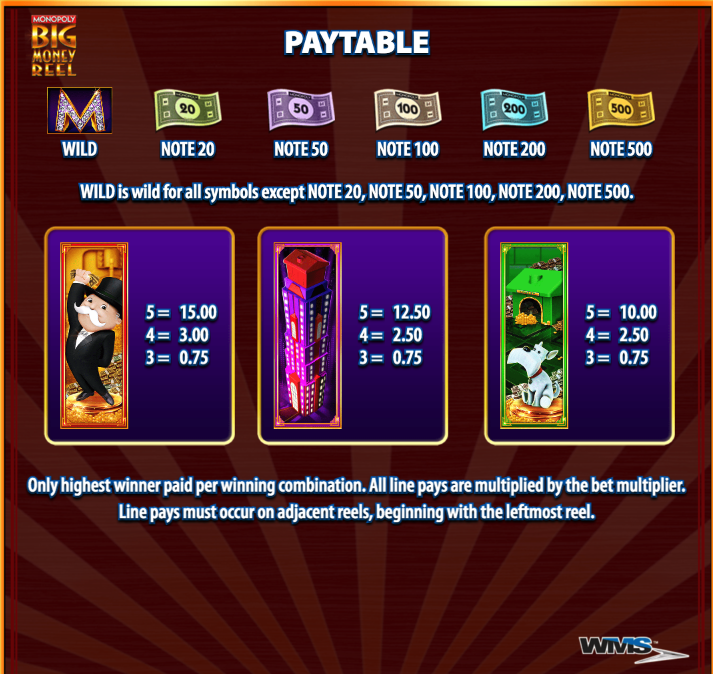 Like the apocryphal London bus, you never have to wait long for a Monopoly-themed online slot to come around and here we have Monopoly Big Money Reel, a release developed by WMS Gaming with some intricate bonus features and engaging graphics – read on to find out more. 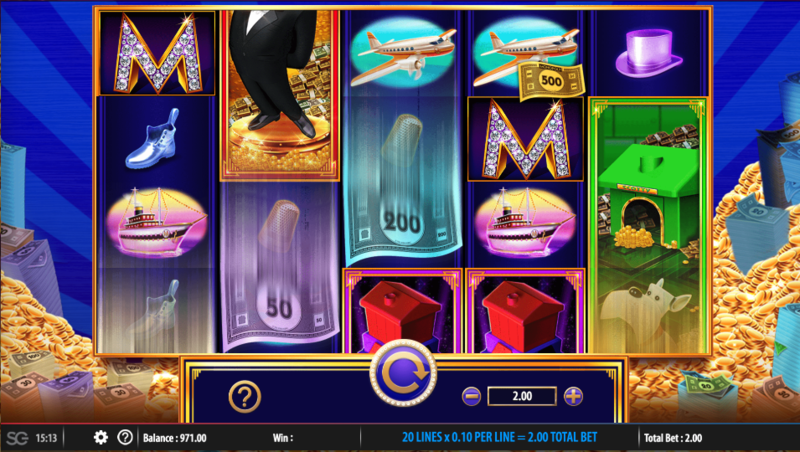 Monopoly Big Money Reel is a five reel slot with four rows and twenty fixed paylines; there’s a 1930s feel to the design with slim gold reels perched above huge piles of gold coins and of course Monopoly money. The three highest value symbols appear stacked on the reels and include Mr. Monopoly, a tall, purple hotel and a dog/kennel; lower values are represented by playing pieces such as the hat, wheelbarrow, boot, thimble, car, ship and plane. 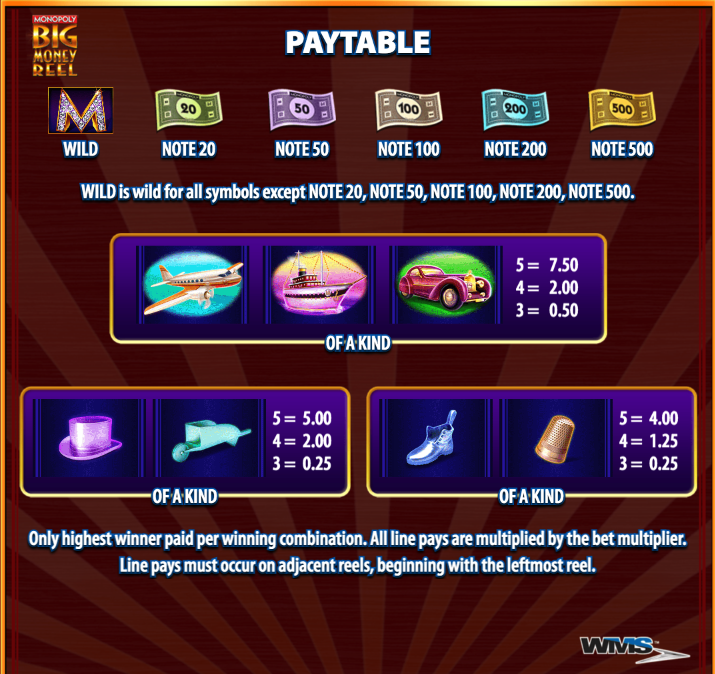 The wild is a sparkly ‘M’ which will replace all others to help form winning matches except for the various bonus banknotes. Five banknotes of different values (20, 50, 100, 200 & 500) can appear as overlay symbols on the reels; if this occurs then all banknotes may change into one value or a mix of the five values. A full screen of banknotes of 20, 50, 100, 200 or 500 will also award a multiplier of 5x, 10x, 15x, 20x or 50x respectively. Utility Bonus – prompt Mr. Monopoly to spin the Wheel of Fortune to collect cash and multiplier values; landing on ‘Collect’ ends the round. Go Free Spins Bonus – awards eight free spins but before each spin a banknote is chosen (including a 1000 value) which will be the only note on the reels for that spin – any notes landing will award a cash prize. Three, four or five ‘Go Extra Spin’ symbols award 3-50 extra spins (chosen by a Wheel of Fortune). Monopoly Big Money Reel is a slot which just about stays on the right side of being over-complex so once you understand how the banknotes work it’s all good; they regularly land on the reels so you always feel as though something is about to happen and it’s not too tricky to trigger the main feature. This game has an RTP of 95.95%.